Today would have been my grandmother’s 91st birthday. I still miss her terribly. 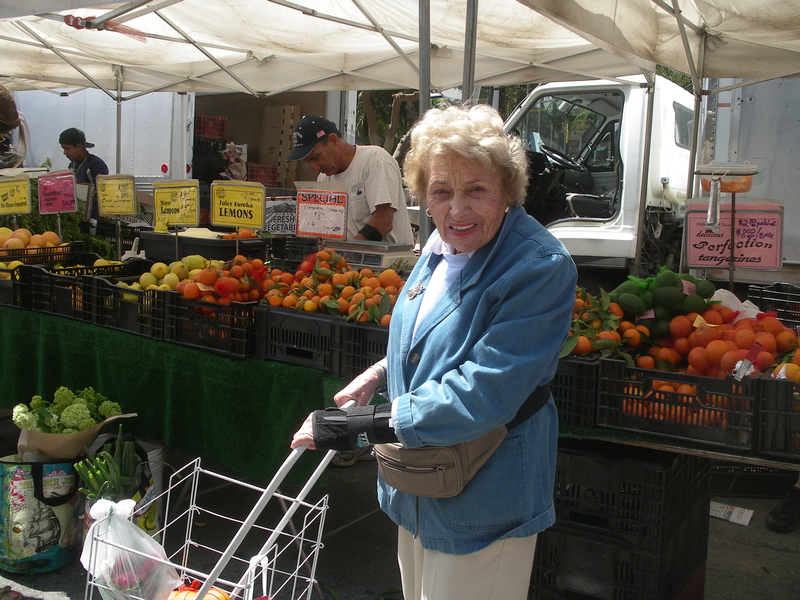 This is one of the many ways I picture her: at her farmers market, the Santa Monica Market in California. In my family, local, delicious food and farmers markets are generational. Before she moved to California, my grandmother would take us to visit farms and farm stands on Long Island, NY. My parents took us to the weekly Greenmarket in a parking lot near our apartment in Manhattan, and to Pike Place Market when we lived in Seattle in the summers (Pike Place was more of a farmers market back then). For those of you raising families or mentoring kids, bringing them to a farmers market doesn’t just make them more interested in healthy and sustainable food now, it plants seeds for their future interests and values. You don’t have to have your own generational history of a farmers market routine to enjoy building one. But when you bring kids with you, they grow up thinking of it as a tradition, the way food shopping simply is. I have many of my grandmother’s small market-going habits. Aiming for favorite vendors who may run out of something delicious, and who we know have the best potatoes or raspberries. Talking to farmers and knowing many of them personally after years of going to the same market. Giving unsolicited recipe advice to someone wondering aloud how to use a vegetable with which they’re unfamiliar, or reassuring them that the strange-looking lemon cucumber is totally worth adding to their salad. It feels trite to say I feel my grandmother with me at farmers markets (and in my kitchen and in flower gardens and on sailboats…) but a piece of her is there. She shaped how I experience them, as did my parents. I hope I can return and continue the favor. Two weeks ago, New York Mayor Michael Bloomberg proposed a ban on selling soda sizes over 16 oz at restaurants, movie theaters, and arenas. Much of the public discussion since then has repeated the beverage industry’s framing, whether supporting or refuting it. Today, let’s take a step back and pay attention to the ban behind the curtain. New York’s proposal places a limit on companies —indirectly, but functionally— by restricting their sales of the most harmful serving sizes of a product. It still allows consumers to buy more, but restricts companies from using big cups as an incentive. This approach puts the responsibility on industry. It’s a win for health. Why does size matter? There’s a concept in environmental health called the dose-response relationship. It’s pretty simple: a large dose of or repeated exposure to a substance may affect someone differently than a small dose or single exposure. A 200 mg pill of ibuprofen is safe. A 200 gram pill of ibuprofen, not so much. You will not find Advil Grande or Advil Venti anytime soon. Unlike medicine, soda isn’t good for you even in a small dose. 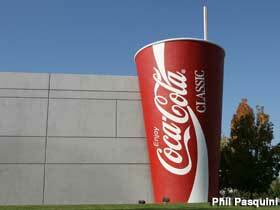 Of course, the health consequences of a large dose of soda aren’t so quick and dramatic as those of a giant pill. But those health consequences are real, and they’re made worse with larger doses and repeated exposure. So while small sodas are also unhealthy, a size ban sends the message that it’s irresponsible to market and sell large sodas. This is especially true if drinking large sodas begets drinking more large sodas. But does it? In short, yes. Portion size can influence human behavior. In the case of soda, it can do so in two ways, one short-term and one long-term. In the long term, high doses of liquid fructose can impair hormones that regulate weight, appetite, and fullness, leading people to consume more and get sick. Sodas and other liquid fructose beverages are dangerous. But they’re especially dangerous in quantity and with repeated exposure. High doses of fructose over time change hormones, brain signals, and metabolism so that we want more soda and food. Also, liquid carbohydrates don’t trigger fullness the way solid ones do, so sugary drink calories may add to rather than supplant meal calories. Some animal studies even suggest that intense sweetness is more addictive than cocaine. Diet is about much more than choice or behavior, as this and other research suggests. The idea of choice loses some meaning when a product impairs the body’s own built-in mechanisms for control. Similarly, “appetite control” takes on a more insidious meaning when a product itself changes appetite. What we consume is largely influenced by availability, income, marketing, culture, and other social factors that can help determine health. For example, the beverage industry disproportionately targets marketing to children and communities of color. Soda’s health problems go beyond its role in appetite. Its impact on health and mortality is felt worldwide. Sugary drinks are overwhelmingly correlated with obesity and diabetes risk, among many other diseases. Fructose intake is connected with insulin resistance and metabolic syndrome. The dose-response relationship between soda and health problems is especially bad in children, who are smaller than adults and going through critical stages of development. A single increase in serving size per day raises a chid’s obesity risk 60%. Sugary drink consumption is also associated with high blood pressure, gout, lower nutrient intake, lower bone density, hypertension, and other health problems. The NYC plan is a simple starting place. There are other ways to limit the reach of the beverage industry, such as sugary drink taxes, restrictions on sugary drinks in schools, or rules about targeted advertisements to children. It will be interesting to see whether changes in fast food restaurants are associated with changes in soda intake at home too, where childhood sugary drink consumption is an even larger problem. A plan like Bloomberg’s has to be part of a larger public health effort that includes restrictions, collaboration across sectors, and public education and empowerment. Communities across the country are strategizing about this issue. But the beverage industry spends millions of dollars on lobbying and fighting public health efforts. The largest size soda that would be allowed under this ban, 16 oz, currently costs just $1.19 at a McDonald’s in Manhattan. But many consumers won’t bother getting a second soda or a refill. Win for the consumer, loss for the industry. Until it figures out how to make a 16 oz secretly-refilling cup.